Whole Foods has a delicious “Mediterranean Crunch Salad” at the cold bar. We wanted to recreate it at home, but a google search for the recipe didn’t exactly match the ingredient list that had been included with the salad at the bar. So we kind of used the recipe online as a guide and added some other ingredients to make it more fabulous. 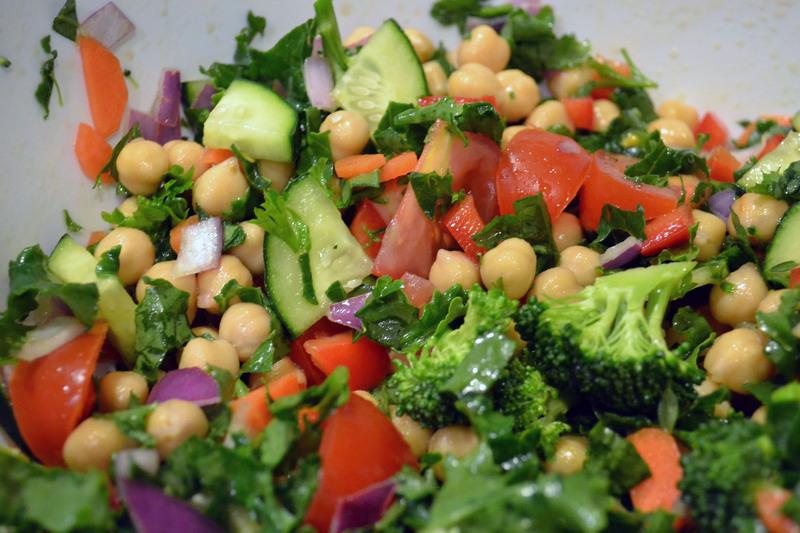 Combine the chickpeas, cucumber, carrot, kale, broccoli, tomatoes, onion, parsley and thyme in a large bowl. In a small bowl, combine the red wine vinegar, apple cider vinegar, and olive oil. Whisk well. Poor the liquid mixture into the vegetable/bean mixture and stir well. Chill at least one hour before serving. Enjoy!